As I mentioned yesterday, we're celebrating Screen-Free Week at Naiya's Waldorf school. It's a bit odd actually since one of the tenets of early childhood Waldorf education is to maintain an almost completely screen-free environment for all the children. Like us, many families have exposed their kids to little or no tv, movies, computer screens, video games, ipads or cell phones and likely won't until they're 9 or 10. Feel free to run screaming from our nuttiness at any time you choose. There are folks at our school for whom being screen-free isn't a regular practice however. A lot of them are new to Waldorf education or just struggle with (or oppose) the concept for various reasons. Since we've not had screens in out daughter's life from the beginning and we're not big screen folks ourselves (other than internet usage and blogging :), having a young child who doesn't watch movies, tv or use a smart phone for anything is pretty easy for us. (I think it's a lot harder if screens have previously been in your life and then you try to give them up. Kuddos to all those struggling with that transition!) We don't really miss screens and spend a lot of time making crafts, telling stories, gardening, doing chores and exploring nature. Others struggle though to reduce screen-time or to understand why they should. It can be hard to wrap your head around. That's why we're sharing information and ideas by celebrating this campaign, and today we're hosting a play date to help inspire families to enjoy the out of doors (a fantastic way to replace screen time) in new and interesting ways. About two years ago our family discovered Letterboxing and that has become a big part of our outdoor family time. But what IS Letterboxing you ask? For those unfamiliar with this fun and interesting pastime, Letterboxing is an intriguing outdoor hobby combining elements of art, puzzle solving, orienteering and exploring and is great fun for children and adults alike. It originated in the 1850's in England but has morphed over the centuries into a worldwide, more modern sort of game wherein seekers follow clues (found on various websites, through local clubs or discovered by word of mouth) to find small, waterproof boxes hidden in public places. Each box contains a logbook and rubber stamp and explorers likewise carry a stamp and logbook when out on a quest. When a letterbox is discovered, finders make an imprint of the letterbox's stamp in their book and leave their personal impression, the date and perhaps a small note in the letterbox's visitor's book. The rubber stamps are most often hand carved and can be amazingly intricate and beautiful. The clues range from very straightforward directions telling one exactly where to go to complicated puzzles or riddles that offer only vague inferences to a box’s locale. It’s like a treasure hunt where the treasure is both taken and left behind! (It’s also a little like geocaching if you’ve heard of that but with more artistic flair and no plastic trinkets.) It’s also a great way to find beautiful places when on a road trip or visiting out-of-town relatives or friends. For our Screen-Free Week play date, we planted three letterboxes in a local park and handed out logbooks, stamps (store bought) and clues to those who came to join us for the day. We'll not post those clues here since we pulled them after the event but for those interested in trying out letterboxing in your local community we'd suggest checking out the Atlasquest or Letterboxing North America websites. Both are filled with tutorials, tips and thousands of clues to boxes hidden all over the world. There's probably a letterbox near you! (If not, maybe you can plant one!) Why not join the letterbox community and enjoy some great screen-free fun? 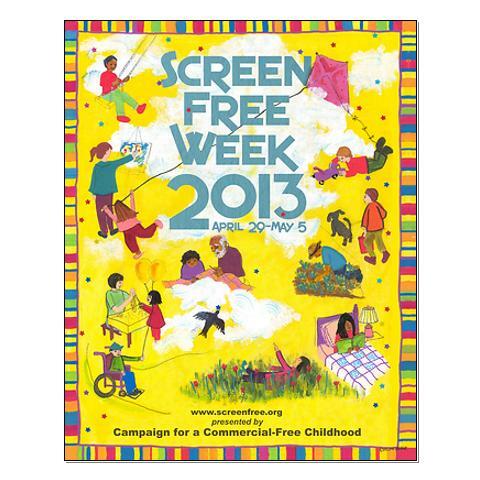 Today marks the first day of Campaign for a Commercial Free Childhood's SCREEN-FREE WEEK. "On April 29 - May 5, people around the country (and world!) will turn OFF TV, video and mobile games, and other screens they use for entertainment, and turn ON the world around them!" At Naiya's Waldorf school (where many families are already screen-free all year) I'm once again helping to organize some little activities and offerings in the Early Childhood classes to coincide with this national week of recognition. I thought I'd share our goings on here each day as we offer up crafts, storytelling suggestions, play ideas and more. Simple crafts are a great alternative to screen time and offer a wonderful opportunity for parents and children to learn something new and create something together. This super simple clothespin and popsicle stick airplane can be made by parents or children and then decorated in myriad colors and patterns with crayons, paint, colored pencils, pens or even strips of tape. Try personalizing each plane with a child’s name or attaching a magnet to the bottom and use it as a handy refrigerator magnet clip! In addition to a clothespin, two large and one small popsicle stick, you will need some kind of glue. Craft glue, white glue or even hot glue all work fine. There’s not much to it really. About a half an inch behind the nose (the clipping end of the clothespin) glue one of the larger popsicle sticks to the top of the pin then glue the other directly underneath it on the opposite side. Glue the tail piece about a quarter inch from the tail end of the clip and you’ve got yourself an airplane! After your plane has dried, decorate or embellish in any way you choose. For lots of other craft ideas for you and your children check out the many ideas under the "crafty craft" label. Enjoy! Every year at just this time we glory in the bright, fresh colors of spring at home. Then our display is sadly eclipsed when we take our annual trip to the ever extravagant Tulip Fest at Wooden Shoe Tulip Farm in Woodburn, Oregon. This year was a tad overcast so we didn't get those glorious shots with the beautiful blue sky but the fields were, as always, amazing. It just puts our little patch of sunshine at home to shame. Naiya also enjoyed some of the activities available for kids including a bouncy house, trampoline bungee jumping, water pump duck races and a bit of carving of some ol' wooden shoes. Somehow we missed her favorite Cow Train this time around but did sneak in a serving of cotton candy and enjoyed a fine Oregon Spring day. The Festival is on until May 5th. If you're a local, you've still got time! Much like last year, this year Naiya's kindergarten class, teachers and parents created another beautiful felted wool wall hanging to donate to the school auction. The children helped make the flowers and also enjoyed a lot of the wet felting. It seems like every year I do this same post of the beautiful blossoms sprouting in early Spring at the Crystal Springs Rhododendron Garden. It is only about five minutes from our house and we enjoy visiting during every season but especially now when the first blooms insist on delighting the senses.